But Are you tired of searching multiple resources to fully understand Linux? This process is not just time-consuming, but also expensive as one has to pay for different courses to know and learn how to setup, maintain and operate a fully backend infrastructure powered by Linux Operating System. Not now! You don't need to waste your time and money, as today's THN Deals will help you choose an excellent course specifically designed to teach you all thing Linux. Linux Essentials Bundle is a complete package that covers everything that is required to become a Linux Pro. From an introductory course for absolute beginners, Linux Essentials Bundle will work your way through BASH and Shell Programming, administering Linux/UNIX systems, creating apps with Docker, using 'vi' for coding and more. 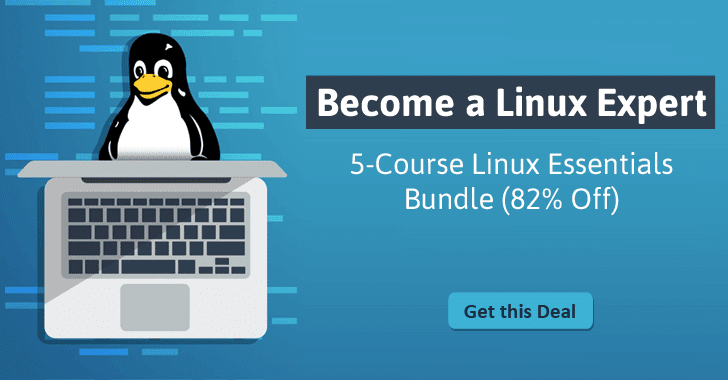 The original value of this course is $225, but at THN Deals Store, you can get this Linux Essentials Bundle course for $39 after 82% of flat discount. Over 50 hours of the training course, you will learn how to build on the Linux OS, develop apps with Docker Access, edit code with vi Editor, and build efficient systems. So, head on to THN Deals Store now and get Linux Essentials Bundle for a super low price of just $39. Computer Hacker Professional Certification Package — at 96% discount — offers you all the material and training you require to help pass CISSP, CISM, CISA, Ethical Hacker and Forensics Investigator to become certified penetration tester. The Python Power Coder Bundle — at 85% discount — offers over 38 hours of online Python Power Coder Bundle, which takes you through the fundamentals of coding to build your own websites from scratch and games using Python.